No disrespect intended, but considered the massive Gibraltar force and the really huge Jolly Roger, they shoulda called us at least via radio and asked us if everything was shipshape! Well since there's no law about flying Jolly Rogers at sea there's really no reason why they should have been bothered. You clearly weren't pirates (what real pirate would fly a jolly roger past Gib?) so they probably had better things to do. tis a lovely flag, very cool looking. wanted to design a flag, but i think a boat or crew would be a good idea first, or at least one other pirate. i havent even finished my garb yet. You don't need a crew, ship or garb to have a flag. You just need an insane and unexplainable desire to fly a flag and stand beneath it shouting bucket loads of 17th century jargon to the hills. The rest will come in time. Good morrow ,Master Red Wake. Pray tell, who is it that be doin' yer graphic work? 'Tis marvelous fine, no jagged edges an' all. 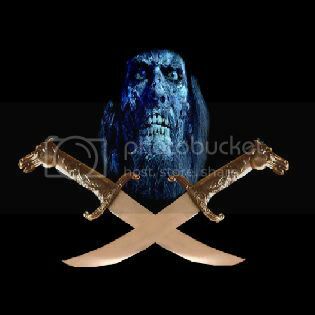 I 'ave a flag in two versions, one wi' a 1816 navy cutlass (see me avatar), and the same flag wi' a Jack Rackham style blade. Now I needs ta know how ta make 'em look as smoothe as yers. Any hints 'r suggestions'l earn ye a great flaggon o' rhum, both 'ere in th, Pub an' maybe down Key West way. It would be my pleasure sir to recreate the flag for you. Please send me the largest version of it that you have to william@towerravens.com and I will recreate it for you. You can buy me lunch at PIP this December. We, sir, 'ave an accord. 'Tis on it's way. Interests:Auto racing, Historical fencing, Ren Faires, Acting/Singing, Sailing of course<br><br>I'm a professional mariner by trade. An Officer in the Canadian Navy. M' hat's off to you William. That be some fine, fine work. Any ship honour'd to fly your work would strike the most dreadful fear in any a victim. An artist I am not, but this be mine. Interests:All history, esp. anything dealing with pirates. Tis on me to do list, i'll be updatin' soon. Interests:The history of the Lowcountry and Sea Islands of South Carolina & Georgia. Here is our Bay Point Buccaneers flag. Just tonight i made a jr on the pc for myself with tubes i made myself (for psp) out of pics of Barbossa, and my own dagger. Well, with a little imagination.. Interests:i love dressing up and pretending to be someone different. Pirates are my favorite thing to dress up as, with faeries as a close second. Obviously i like larp games, and i also design my own costumes and i like to design normal clothes too. but if anyone could show me a link to a potc club, i would LOVE to join. Captain jack ROCKS! ne1 know where i can find a crew in my area? Cool! i need to learn to photoshop. 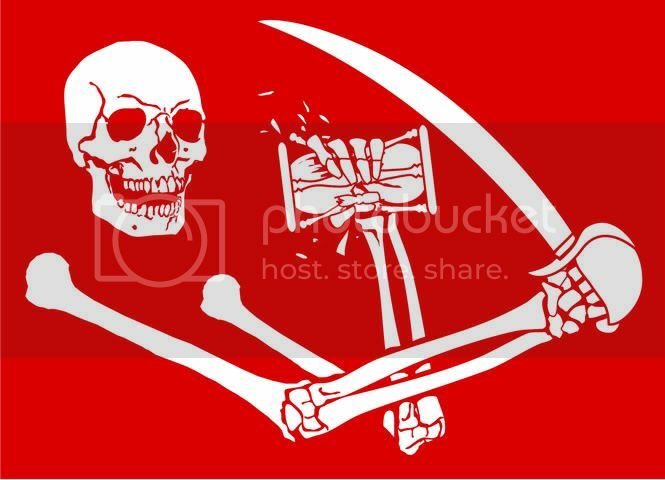 i tried to post my brother's flag on, but it apparently is the wrong type of file, so... but its a cool flag, looks like the union jack but has a white background, black stripes like this + across it and red like this x on top, with a skull in the middle. pretty good, considering he's only 12. better than the one he wanted with the monkey and the eyepatch. Thanks, the silver one is now my official logo on my domain. Your brothers flag sounds very cool! You should be able to save it as other file, you open it and then simply resave it. I make everything in paint shop pro, just as good but soooooo much easyer, and have you noticed EVERYWHERE on internet there's free tubes, sparkles, filters etc etc etc and tutorials but for photoshop there isn't too much. Interests:Attending Ren. Faire's with my Pirate Guild, the HMS Stranglehold, other hobbies are Drinking, Carousing, and generally having a grand time where ever I go. Here is the Capt'ns woman posing next to the Stranglehold's colors. thanks fer sharin' , made me heart feel warm just like a good drink o rum. Interests:I am the Captain of The Cursed Few, the deadliest pirate crew on the East Coast. I am a charter member of the Order of Leviathan, or "Devil's Dozen". Location:Colchester, Essex. United Kingdom. Britans oldest recorded Town. That'll be why they have only 8 flags registered. None of which appear in this thread. 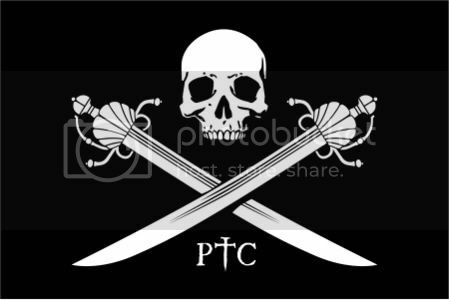 The new ensign for the Pirates of Treasure Cove. Thank you. I'm motivated by a love for art and pyracy. The PTC Ensign at Palm Springs...and look...Rob Lowe.